Objective This study explores participants’ experience of self-management of dizziness using booklet-based vestibular rehabilitation (VR), with or without expert telephone support. Design Semistructured qualitative interviews were conducted. Setting Participants were recruited from primary care practices as part of a large RCT. Participants Interviews were carried out with 33 people (10 men and 23 women; age 27–84) self-managing chronic dizziness using booklet-based vestibular rehabilitation, with or without expert telephone support. Results Data were analysed using inductive thematic analysis. The majority of participants in both groups reported a positive experience of VR therapy, with many participants reporting an improvement in their dizziness symptoms since undertaking the therapy. Participants in the telephone support group felt that a genuine relationship developed between them and their therapist within three short sessions, and described their therapy sessions as reassuring, encouraging and motivational. Conclusions The VR treatment booklet appears to be a valued tool for self-managing chronic dizziness and people appreciate receiving remote telephone support. Thematic analysis is a rigorous systematic approach to qualitative analysis. Recruitment continued until the data reached saturation. This study was nested within a randomised controlled trial and explores patient experiences of the therapy. The sample inevitably comprises only of those people willing to be interviewed and it is, therefore, possible that those who appreciated the therapy may be over-represented. Incorporating qualitative work in clinical trials is an important part of person-based intervention development25 as it helps in understanding participants’ experiences and acceptability of the therapy. In recent years there has been an increasing focus on the patient experience of treatments and management of audiological conditions,26 although no research to date has assessed participants’ experiences of self-management of dizziness. This study aims to understand participants’ experience of using booklet-based VR alone or with telephone support in order to improve understanding of the experience of these models of dizziness self-management. This study used qualitative, semistructured interviews to explore and understand participant experiences of dizziness self-management using booklet-based VR alone or with telephone support. The telephone support consisted of three short sessions (one 30 min session followed by two 15 min sessions) that was delivered by audiological scientists who received standardised training in delivering the telephone therapy. A treatment manual was followed during the telephone sessions and focused on ensuring the VR programme was implemented appropriately. Therapists also elicited and addressed participant concerns and agreed on goals. Follow-up sessions primarily focused on encouraging adherence to the programme and discussing barriers to adherence. Approval for this study was granted by the National Research Ethics Service. Participants were a subgroup of participants taking part in the previously mentioned VR trial of self-management of dizziness.23 Participants were invited to take part in the trial if they had a diagnosis or treatment for dizziness in the past 12 months. Eligibility of potential participants was assessed at baseline to ensure participants were currently experiencing dizziness symptoms. Information about this study was included in the information sheet participants received in their invitation pack to take part in the VR trial. Consent for this study was included on the VR trial consent form, and it was made clear that participation was voluntary and would not affect participation in the VR trial. Recruitment was managed by an independent administrator and interviewing took place within a couple of months of participating in the VR trial. Initially, consecutive sampling of participants who completed VR therapy was used. Participants were also sampled towards the end of the trial after the therapists had become more experienced in delivering the treatment. Purposive sampling was used towards the end of recruitment to ensure adequate representation of male participants. Recruitment continued until the data reached saturation and no new codes emerged. The sample consisted of 10 men and 23 women between the ages of 27 and 84 (M=59.3, SD=14.27). Fifteen participants (6 men, 9 women) were in the booklet only condition group and 18 participants (4 men, 14 women) were in the booklet and telephone support condition group. Participants were invited onto the trial because they had a diagnosis of vestibular dizziness. Symptom severity was measured by the Vertigo Symptom Scale—Short Form27 as part of the VR trial. Ten participants had high symptom severity (2 booklet only; 8 booklet and telephone support), and 23 participants had low symptom severity (13 booklet only; 10 booklet and telephone support). Semistructured telephone interviews were conducted between March 2010 and March 2011 by the first author (IM), and another female postgraduate health psychology trainee. Both researchers had limited knowledge of dizziness aetiology and treatments. The interview schedule is displayed in figure 1. Semistructured interview schedule—italics indicating questions for participants from the telephone support group only. Before starting the interview, the researcher spent a few minutes explaining that the study aimed to understand participants’ experiences of the treatment they received; it was emphasised that there were no right or wrong answers and that the interviewer was not involved in designing the clinical trial. It was hoped that this would minimise participants giving socially desirable responses such as being overly positive about their treatment. The semistructured interview schedule included 14 broad, open-ended questions with follow-up prompts. Interviews began by asking participants what they expected from the VR trial and moved towards discussing participants’ experiences of the treatment. An inductive approach was taken, so that the interview schedule was used to guide, rather than dictate the interviews. The course of the interview was often tailored according to participants’ responses in an attempt to explore topics spontaneously raised by the participant. The interviews lasted between 9 and 47 min (M=18.27 min, SD=8.47). Interview transcripts were transcribed verbatim by an independent administrator. Analysis of interview transcripts was carried out by IM using an inductive thematic analysis where dominant themes were identified through close examination of the data.28 Interview recordings were listened to several times, and interview transcripts were read and re-read to ensure a high level of familiarity with the data. First, open coding was carried out on 6 interview transcripts using maxQDA software and an initial coding schedule was devised in order to clearly define each emerging theme. The coding manual was then revised throughout the coding of the remaining transcripts. The original codes were frequently combined or divided into further codes depending on the emergent findings.28 Themes were continually compared with newly coded interview transcripts to ensure that these were readily applied to the data by using the researcher’s familiarity with the text and coding manual to frequently assess and reassess how codes were being applied to the raw data. The coding manual was discussed within the research team and final amendments were made. The final coding manual was then applied to all transcripts. The analysis process was carried out systematically, with category agreement being obtained at each stage of the analysis and inter-rater agreement between authors IM and SK obtained for the final coded data. To maintain anonymity, interview data were labelled by participant number, gender and treatment group (BO for booklet only and B+TS to indicate booklet with telephone support condition). Analysis of 33 interview transcripts identified three main themes and eight subthemes. The themes, subthemes and key content are depicted in figure 2, highlighting the main group differences and similarities. The majority of the themes and subthemes arose from both groups (booklet only and booklet with telephone support), albeit in different contexts. Diagram of themes, subthemes and key content; •=Content from both treatment groups; ♦=Content mainly from booklet-only group; ▪=Content mainly from Booklet with telephone support group. The identified themes can be organised into three main themes: (1) living with dizziness prior to the VR therapy; (2) experiences of therapy, and (3) therapy barriers and impact. Owing to the limited scope of this paper, the results will be presented in terms of these three themes. Supporting interview quotations are provided. Participants were not explicitly asked about their experiences of living with dizziness, yet most participants spontaneously spoke about this during the interview. Several participants from both treatment groups described the practical ways in which their dizziness symptoms had affected their day-to-day lives. Dizziness was described as having major and often devastating consequences on participants’ lives in terms of disruption to daily tasks. A large proportion of participants in the telephone support group mentioned their progress being monitored, and receiving advice and health information during the telephone session. Health information largely related to causes of dizziness and explanations of the way in which VR exercises retrain the balance system, which participants found helpful. This study aimed to understand participants’ experience of using booklet-based VR alone or with telephone support for dizziness self-management. 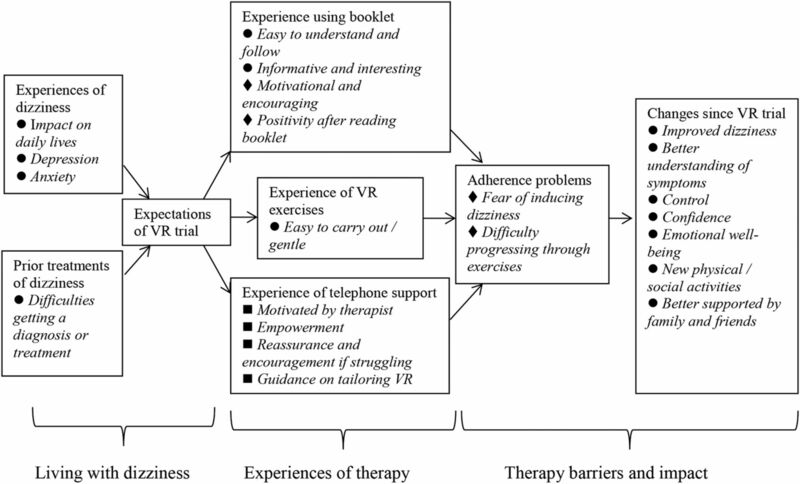 The majority of participants reported a positive experience of VR therapy, whether it involved using the booklet alone or was accompanied by telephone support. Participants found the booklet easy to understand and follow, and were surprised by how simple and gentle the exercises were. Many participants also discussed improvements in their dizziness symptoms since following the VR exercise. Participants described feeling more confident, empowered, less anxious and more supported by family and friends. Participants also discussed partaking in social and physical activities that they could not previously do. These findings suggest booklet-based VR to be an acceptable and valued model for delivering VR. There were some indications that telephone support might encourage better adherence to the VR programme. Many participants described the support of their therapist and the positive attitude of their therapist towards their progress as being a key element in their perseverance with the exercises. Lack of adherence in the booklet only group was most commonly explained by fear of its inducing dizziness symptoms. In contrast to the booklet only group, participants who received the telephone support were given the opportunity to discuss their concerns with a VR therapist who was able to provide advice and allay fears that the exercises were damaging their balance system. The VR trial results23 found adherence to the full programme of exercises was reported by 44% of participants from the booklet with telephone support group compared to only 34% of participants in the booklet only group, although this group difference did not reach statistical significance. However, exploratory retrospective analyses found that participants from the telephone support group reported carrying out the exercises with greater intensity compared to the booklet only group. A limitation of this research is that the sample inevitably comprises only those people willing to be interviewed and is, therefore, likely to be non-representative of the trial population. In particular, those who appreciated the therapy and the telephone support may well be over-represented. However, several aspects of this research give confidence that the results reflect participants’ positive experiences of self-managing rehabilitation for chronic dizziness. Thematic analysis is a rigorous systematic approach to qualitative analysis and the inductive approach taken allows the findings of this study to be grounded in the data rather than being drawn from previous theories. 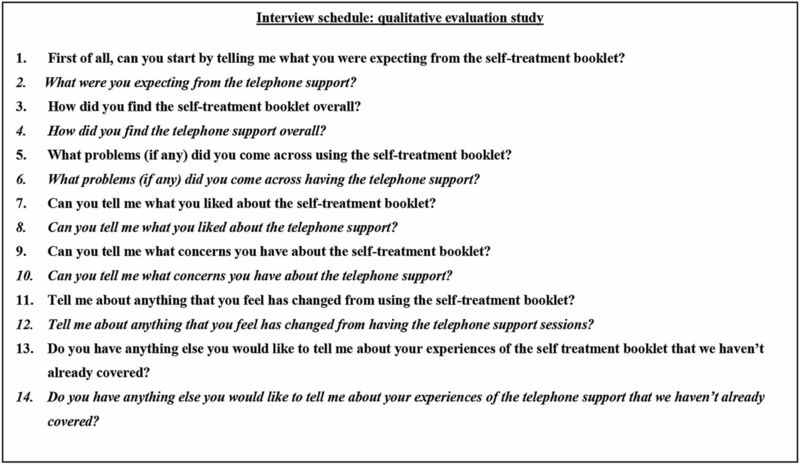 The consecutive sampling methodology, managed by an independent administrator, allowed this study to include participants receiving telephone support from therapists at different stages in the RCT and therefore, varying degrees of experience in this particular setting. Recruitment continued until the data reached saturation, after which emerging theories were thoroughly explored through theoretical sampling, allowing for a varied sample to be included in this study. Interviewing took place within a couple of months of participants completing the 12-week treatment programme to ensure the experience of therapy was recent and fresh in the participants’ minds, a particularly important issue when dealing with elderly participants. While this approach was preferable, a longer delay between therapy and interviewing might have yielded an insight into long-term effects and lasting changes. Booklet-based VR has previously been found to be a cost-effective model of VR delivery,23 and the current findings suggest it to also be acceptable and valued by patients with chronic dizziness. Telephone support enhanced tailoring the VR therapy to the individual. Participants in the telephone support group felt that a genuine relationship developed between them and their therapist in three short sessions. This highlights the potential benefit that minimal remote contact can have on participants’ engagement in self-management programmes. The telephone-based method of delivering therapy did not appear to negatively impact the popularity of the treatment and may, in fact, be preferred by many patients with dizziness as previous research has found this patient group to be reluctant to travel for treatment.33 Telephone delivered therapy is a fast-growing, cost-effective method of delivering therapy and might be particularly beneficial for use in elderly or disabled patients.
. Prevalence and presentation of dizziness in a general practice community sample of working age people. Br J Gen Pract 1998;48:1131–5.
. How common are various causes of dizziness? A critical review. South Med J 2000;93:160–7; quiz 168.
. A systematic review of vertigo in primary care. Br J Gen Pract 2001;51:666–71.
. Vestibular rehabilitation for unilateral peripheral vestibular dysfunction. Cochrane Database Syst Rev 2007;(4):CD005397.
. Screening for vestibular disorders: a study of clinicians’ compliance with recommended practices. Med Sci Monit 2008;14:CR238.
. Content and thematic analysis. In: Marks D, Yardley L, eds. Research methods for clinical and health psychology. London: Sage, 2000:5667. Contributors All authors were involved in the study design and analysis. The majority of interviews and initial coding of the data were conducted by IM. SK provided inter-rater agreement for all final coded data, and LY provided category agreement at each stage of data analysis. All authors were involved in the writing and preparation of this manuscript. Ethics approval NREC and University of Southampton REC.